The Space Systems Research Corporation is excited to announce the start of the MIGHTI program at the U.S. Naval Research Laboratory. SSRC has been asked to provide program management support for the Michelson Interferometer for Global High-resolution Thermospheric Imaging (MIGHTI) instrument. MIGHTI is a Naval Research Laboratory (NRL) instrument on the UC Berkeley led ICON Explorer Proposal submitted in response to the NASA Announcement of Opportunity (AO) NNH11ZDA002O issued by NASA HQ. ICON was selected by NASA HQ for Phase A development and evaluation as a potential future science mission. As part of the ICON mission, MIGHTI will make two perpendicular line-of-sight wind and temperature measurements of the same air volume in the ionosphere, less than 8 minutes apart. Each measurement represents a set of limb observations for tangent altitudes between 90 and 300 km. Accurate spacecraft velocity, position, and pointing data allow the (vector) subtraction of the satellite velocity yielding the thermospheric line-of-sight wind speed altitude profile. The vector combination from the two perpendicular lines of sight provides an altitude profile of wind vectors. 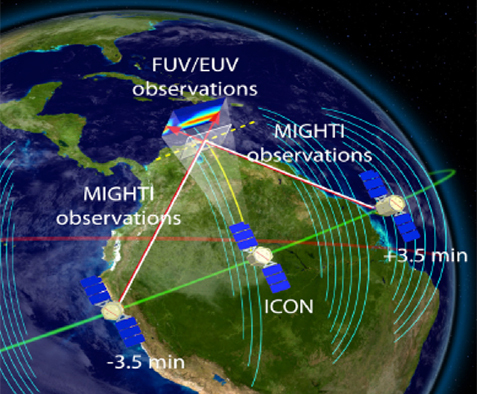 The MIGHTI instrument consists of two identical sensor units with fields of view that point 45 and 135 degrees from the spacecraft velocity direction toward the port (northern) side of the ICON satellite. The SSRC team will provide program management support for the MIGHTI development. The SSRC team has extensive experience working with the NRL and NASA on space science instruments. SSRC was selected based on proven experience and pre-existing relationships with the NRL. Next PostSSRC moves into implementation phase for new solar mission.